Hollywoodbets Tzaneen chose Pharare Sethabaneng Drop-In Centre as their organisation of choice for Hollywoodbets’ Social Responsibility Programme. Read on to learn more about the team’s donation. The Pharare Sethabaneng Drop-In Centre takes care of orphaned and abandoned children in their area and has been doing so for four years. Team members from the Tzaneen branch visited the centre to show their support and deliver a much-needed donation. 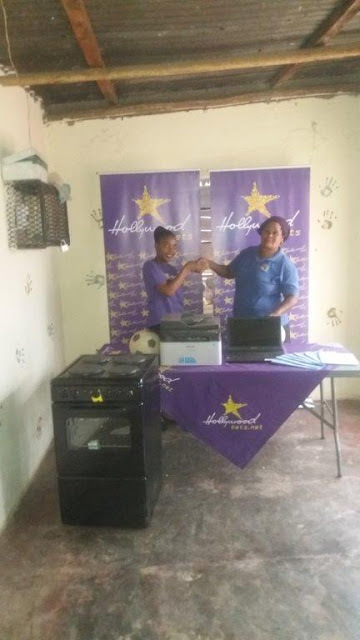 The staff members at Pharare Sethabaneng were grateful to receive a photocopier, a laptop and an oven. The centre is situated in an open piece of land and up until now they have been using firewood to cook their meals. This new oven will help them to prepare their meals much more quickly and easily. The photocopier and laptop will assist them greatly with their administrative work. In the past the staff had to travel a few kilometres when they needed to make copies so having their own copier on site will help them save time and money. Our team was happy to be able to help and we encourage them to keep up the good work they’re doing! Staff members at Pharare Sethabaneng were grateful to receive a donation from Hollywoodbets Tzaneen.